Recently, GBS started with the development and construction of a new state of the art test facility with advanced techniques. We expect that by mid-June 2016 this facility will be fully operational. The new test facility will cover an area of over 100 m2, where three gearboxes of different sizes can be tested simultaneously! The maximum weight of the test stand is 30 tons per gearbox. We can also perform loaded test runs off your gearbox to a capacity of 500 kW. The loaded 500 kW test run has the advantage of giving us a unique setup to simulate the actual operating field conditions of the gearbox. Imperfections can be overcome and the quality of the gearbox can be guaranteed. 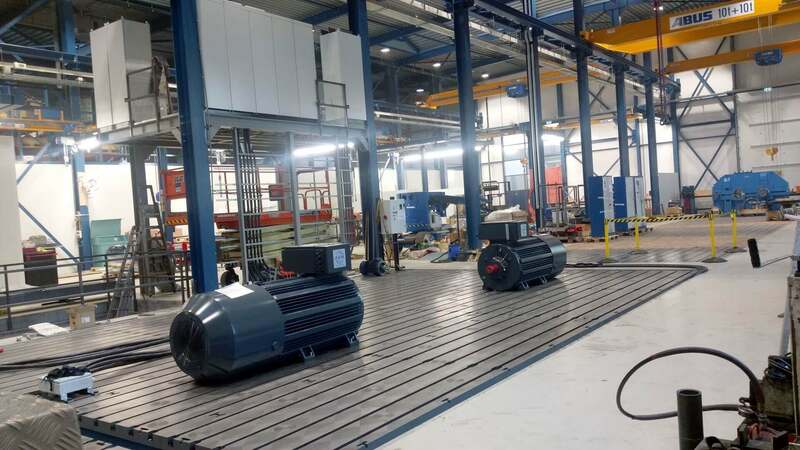 Besides low and medium speed gearboxes it is also possible to connect high-speed gearboxes, depending on an external oil supply on our test bench. For this, a separate oil supply and discharge system is provided with a flow of 250 liters per minute. In addition, this system is equipped with numerous high-sensitivity sensors to monitor the gearbox. In this new set up we have paid great attention to the quality of the oil during the test run. Our test stand is equipped with a basement where two standard type oils are being continuously monitored. Also, these oils are permanently filtered to a purity level better than the original quality of the oil! Oil used for factory tests will be analyzed for cleanliness before adding to gearboxes and will be filtered to meet cleanliness requirements if necessary. Before the actual factory test, the gearbox will be flushed and the oil cleanliness requirements are monitored. Filtering of the oil is in this stage still required to remove any contamination left after assembly or added during filling the gearbox with oil through an inspection cover. If the oil during flushing of the gearbox meet cleanliness requirements, filtering will be stopped and the factory test will start. During the factory test, the gearbox is still being flushed. However, the oil is not filtered anymore. By flushing the oil, the oil cleanliness can be monitored continuously during the factory test. GBS is the only company in the Netherlands that uses a one of a kind live stream service. This live stream can be viewed on the website. Remote viewing of live images from the test stand and the online condition monitoring of the sensors is available to our customers. We hope we can fully screen and test your gearbox at our workshop in the near future. Our sales employees will gladly answer all your questions.